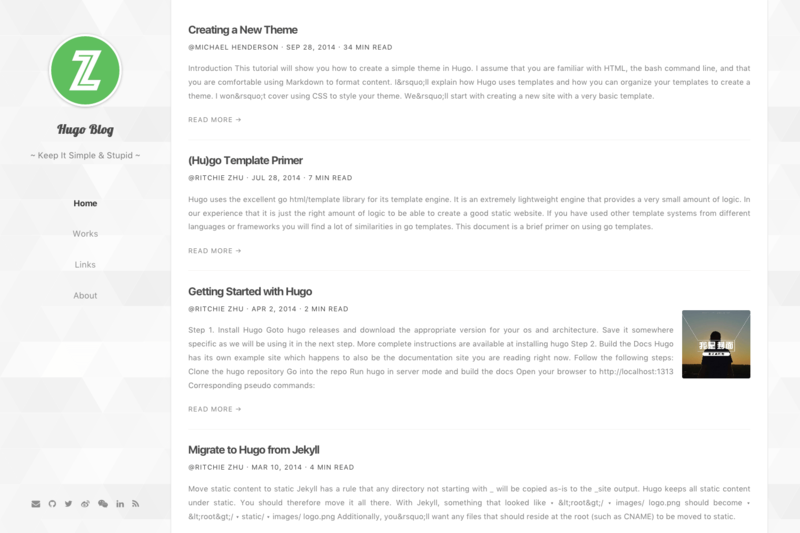 An responsive light & clean hugo theme for blogger. Hugo Nuo is an responsive light & clean hugo theme for blogger. This theme features several page layout, like an about page for your portfolio, a links page for your friends’ blog, a tags page for your tags cloud, a works page is under development. This theme makes many third-party hugo shortcodes, including Codepen, JSFiddle, Video.js, Music 163 and Sheng Xiang, Asciinema. After installing the hugo-nuo theme successfully it requires just a few more steps to get your site finally running. Take a look inside the exampleSite folder of this theme. You’ll find a file called config.toml. To use it, copy the config.toml in the root folder of your Hugo site. Feel free to customize this theme as you like. The hugo-nuo theme add home, works and tags page to initial site menu, you can add your own menu item here. You can choose someone to display, the recommend number is 7 icons. The hugo-nuo theme support Google, Bing, Baidu, Sogou, 360 webmaster’s meta verification tool, you can activate as required. The seotitle and description will show in search results and browser title. seotitle = "Hugo Blog Title (SEO Version)"
description = "Hugo is one of the most popular open-source static site generators. With its amazing speed and flexibility, Hugo makes building websites fun again." The hugo-nuo theme support Google Analytics and Baidu Tongji, In China you can choose both Baidu Tongji and Google Analytics. The hugo-nuo theme support Disqus and Chang Yan social comment system, In China you can choose Chang Yan because Disqus is blocked by GFW. If you want to use Disqus, you should disable changyan to false. The works page layout is under development, you can use github homepage for replacement temporarily. Thanks to @bwangelme’s great PR, the tags page has been done, you can use this page by adding it to main menu. Change the content of links.md, set page layout to links, If you want to add about page to menu, set menu to main and weight to 40.
description = "A full-stack developer"
description = "Another full-stack developer"
The links page need friend’s avatar, finally you should add friend’s avatar to content/media/links directory and link to avatar in the links.toml file. Change the content of about.md, set page layout to about, If you want to add about page to menu, set menu to main and weight to 50. Write something about you here. Write your portfolio as a post here, if you want comments in about page, you should turn comments to true. Then create a file at data/resume.toml, where the resume page reads data from. You can reference exampleSite/data/resume.toml for how to construct your resume. The resume page will be located at /resume off your website root. Different from the about page, the resume page is intended as a one pager that you can print out for job hunting. If you don’t want change default theme SCSS files, you can override styles with an custom SCSS file. Set file in your config.toml as below. Then create styles/custom.scss file and write your own styles there. your custom rules will override the default ones. you can place custom.scss in theme-scoped or site-scoped assets folder. This theme has been using hugo pipes instead of webpack now, no build package needed now. I use ImageOptim to make images load faster, I recommend this tool to you. From Hugo 0.28, the default syntax hightlighter in Hugo is Chroma; it is built in Go and is really, really fast – and for the most important parts compatible with Pygments. Run hugo gen chromastyles -h for more options. See https://help.farbox.com/pygments.html for a gallery of available styles. Also thanks to Steve Francia for creating Hugo and the awesome community around the project.